What will happen in five years from now. According to today’s Times of India, the article of ” Five amazing things” was circulated. As I am always pointing out it is very important to envisage what will happen in not only near future but also the long term future. But 5 years is not long term future. If you have your own view and be ready for the future, you don’t be afraid of future. This article herald the inception of rapid change of society caused by development of new technologies. They illuminate the points as below. One of serious projection is NO. 4 as Musk articulate his view. AI would get rid of human. AI is, as you know, artificial Intelligence, which technology is growing drastically due to new concept of Deep Learning. Only two decade ago, AI was in winter stage because there was no tremendous progress in the area. But suddenly, for example, IBM Watson computer won over the human and became champion of TV show game contest. Also, Google is releasing self-driving car within 5 years. In that case, the social implication and ramification will be huge. Imagine that teeming with a lot of driver-less car on the street in your town, what will happen. Employment rate will be which rate? Then a lot of unemployment might happen, which would drive vast number of jobs from human and will propagate trepidation about future. Brace for tough future society! AI will annihilate your job in the future. heralds of advent of mass job-less situation. let me kindly point out it is a big tribulation for you in the future. You will lose your job because of AI. Even now you may feel forebodings about your future. But I surmise from various data and information what will happen in future society . corroborate the prediction from some experts statements ( you can down load the article). Unless you take your action immediately now, you would fall into a quagmire of poor life plight. Do you know the aphorism ” Heaven helps those who help themselves. ” , don’t you? Do you know Ray Kurzweil name? In the US, he is famous guy. But in Japan, he is only known by few. Recently, Japanese economy is said lackluster. Moreover, Japanese people mentality is downcast. Discrepancy between rich and poor is more expanding further year by year. Can you imagine that SONY which were said excellent company is suffering huge loss and facing excruciating situation now? This is very symbolic fiasco corroborating there is no exception of even excellent company lasting euphoric time for ever. In order to avoid bleak future of the country, only solution is innovation. Nobody dismiss the importance of innovation. However, on the contrary, particularly said-excellent companies are facing “innovation dilemma”, because they cannot forget the past success and sticking to legacy way which worked well at that juncture. They cannot get out of the comfort zone. Then gradually, they are getting into deep pitfall and when they come to realize, it will be too late. 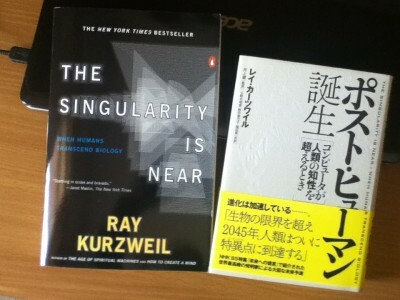 In Japan, that almost nobody knows Ray Kurzweil name is showing the Japan’s current situation, which means nobody envision the future after 20 years to 30 years from now on. The singularity will happen around 2045, which one single computer capability exceeds all human brain of 9 billion. Ray Kurzweil deduce the future from the fact what happened in the past decades and extrapolate what will happen 30 years from now using such as Moore’s Law. His envision is very convincing for me. Some people may say it is too optimistic view, but considering current situation what is happening such as driverless car or auto driving ( Google experiment is well known. ) Wearable computers and robot technology. I am sure, after 30 years, things which mediocre person cannot imagine will happen. Whether you can survive in the dramatic future is only up to you and how you can be ready from now. very cool ! Tesla car! Hove you ever watch Tesla car? if not, please watch the site and movies. You can change the image of ( EV )Electric Vehicle. I want to buy EV if I can buy a car now. But still it is eye-popping price around 80,000 USD. But it is sports car not normal car. So let’s compare with Mercedes, BMW, Audi like luxurious car. They are not so different from price point of view. Particularly, for upscale consumers who can buy opulent goods like exorbitant pricey watch, lavish all around oversee traveling, eating out in inordinate restaurant, purchasing Tesla car is nothing for them. That’s why in the US movie star, famous celebrities are rushing to buy the car. Above all, the Tesla car exhaust no CO2. For eco-friendly and environmental conscience people, EV is must buy. If you see the structure, it is very simple with very few parts comparing legacy petrol car. I am sure sooner or later, the price will plummet drastically within 5 years. At that juncture, legacy automobile industries will suffer huge predicament unless taking some measure. Innovation is excruciating for those who does not make an effort and procrastinate to improve the current situation. After 10 years, if you regret why I did not take an action and I should have done something earlier, it will be too late. As history shows a lot of excellent companies were annihilated.